Safely and effectively maintaining your gardens is highly important, especially when it comes to pruning and trimming trees at great heights and awkward locations. Fiskars have combined their renowned PowerGear technology and gardening expertise to give you more power for less effort. Introducing the revamped PowerGear X Tree Pruners Range. The Fiskars range of tree pruners not only provide safe access to pruning and trimming branches at height, but also allow users to stand while attending to ground level trees and bushes. This essentially keeps users in an upright and comfortable position and eliminates the pains and strains associated with constantly bending and kneeling. The Fiskars Tree Pruner Bypass Telescopic UP86 is an extremely useful tool for anyone with tall trees to cut or overgrown bushes and hedges. Its long reach shaft makes hard to reach garden tasks accessible from a safe standing position, making it a perfect tree trimmer. The telescopic shaft length is adjustable from 2.4 metres –4 metres. With both stepless and ambidextrous adjustments the total reach of the tool is up to 6 meters. 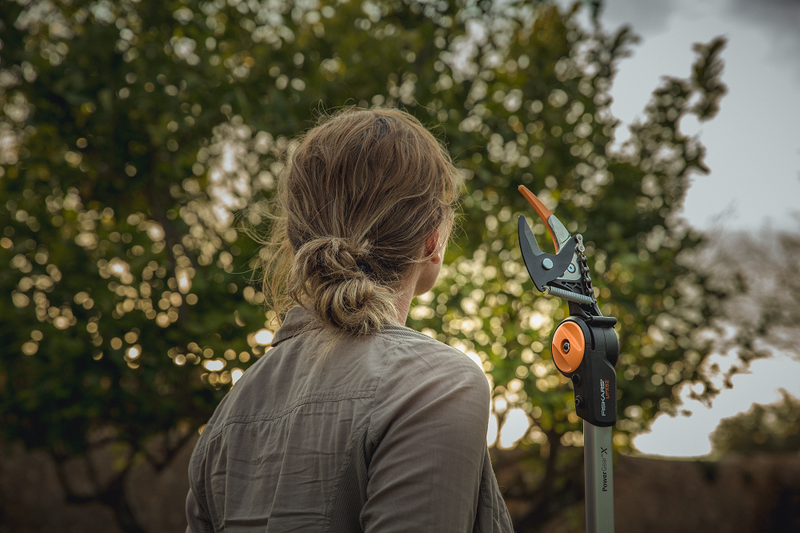 If telescopic reach is not required for your gardening needs, the smaller UPX82 Tree Pruner is the perfect choice, allowing a cutting reach of 3.5 metres. Both the Fiskars PowerGear X Tree Pruners feature a lightweight design with a fully customisable cutting angle of up to 230º. Boasting a maximum cutting diameter of 32mm the precision-ground stainless steel and anti-friction blade coating allows for a more powerful cut with less effort. Pruning high branches is made safer by allowing users to set the cutting angle and stand away and to the side of falling branches. The newly added orange blade support at the cutting head provide a highly visible guide to direct branches into the cutting head. An additional Branch Saw attachment is also easily fitted to the PowerGear X Tree Pruner range. For larger branches that are unable to fit into the cutting head, the Branch Saw can be quickly connected to saw a limb of up to 380mm with cutting action on both push and pull motions. With these brilliant tools, you will always be able to access that tricky overhead branch and bring it down safely and without too much fuss or trouble.